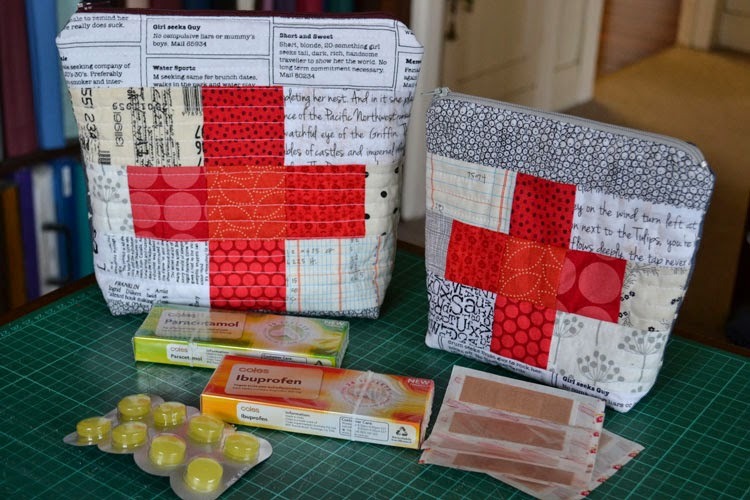 The idea for this pouch came about as my daughter has just bought herself her first car and she wanted to have a basic first aid kit to keep in the glovebox. 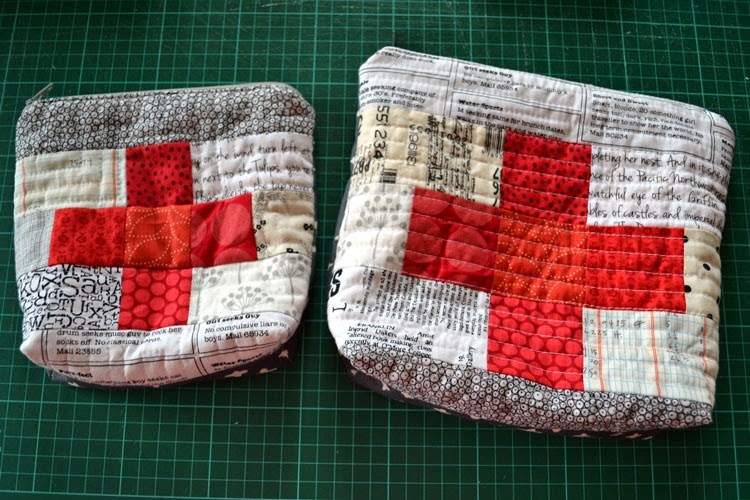 After seeing similar “Plus” blocks around recently, I thought that incorporating one into a block for a zipper pouch would be perfect for her. 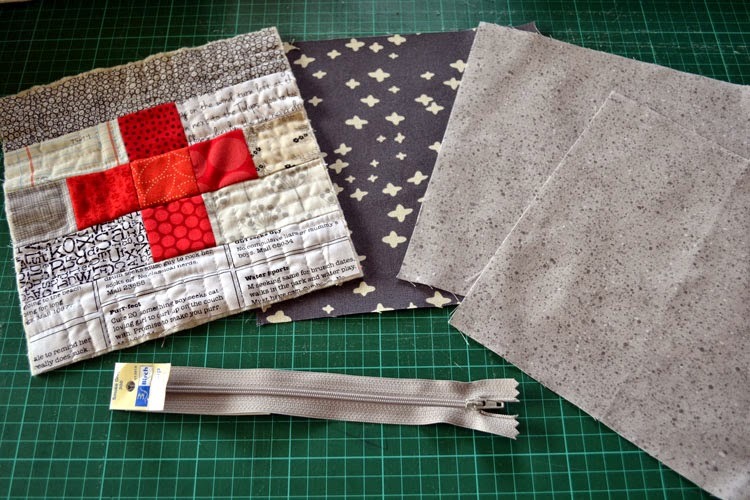 Basic sewing supplies: Rotary cutter, quilting ruler, pins, thread. 3. 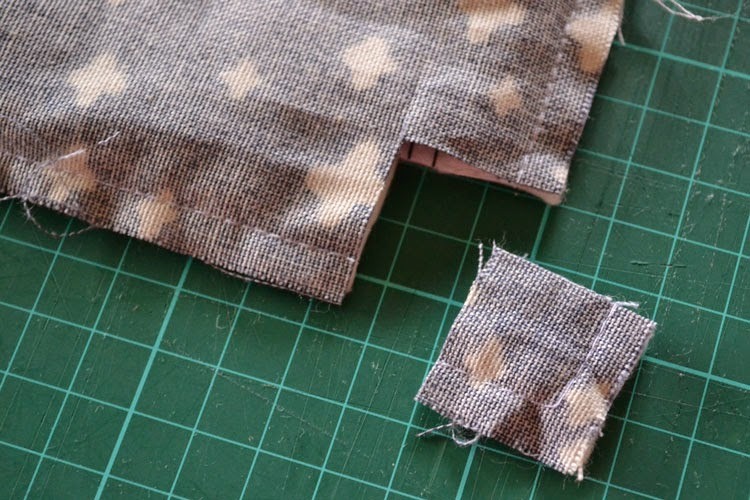 Pin and stitch the pieces together using a 1/4″ seam. 4. 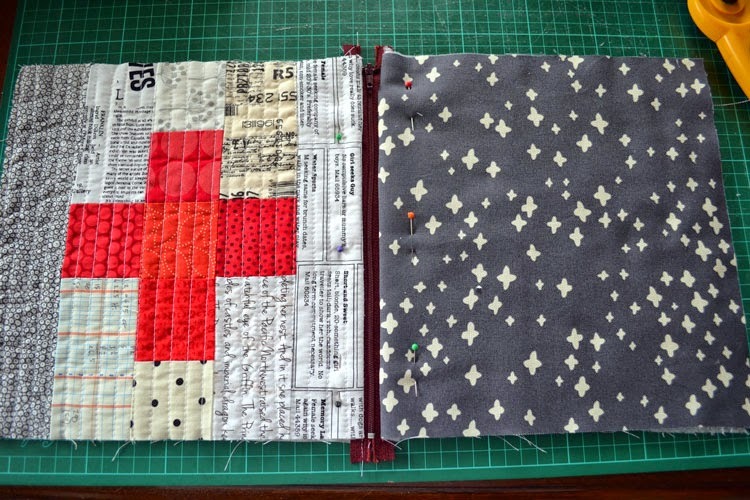 Press the seams open, then sew the rows together as below. 5. Press the block again, lay it on a piece of batting and quilt as desired. 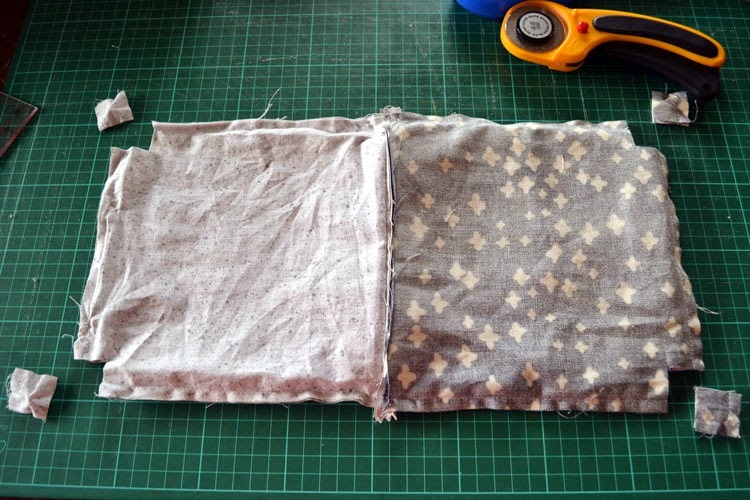 – I just did some horizontal straight lines across the pouch about 1/2 inch apart. 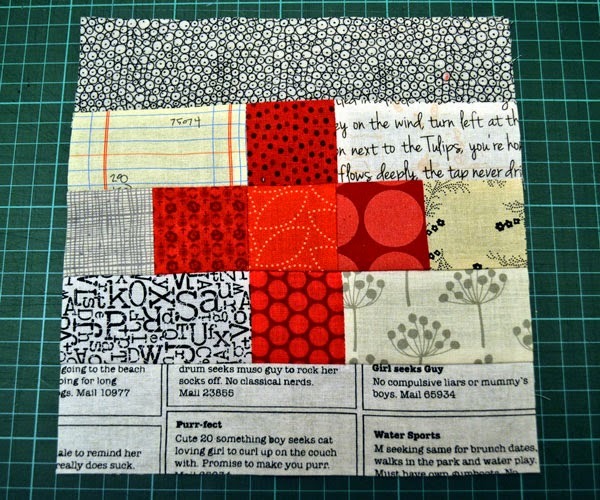 After quilting, trim the block back to 7.5 x 7.5″. 6. 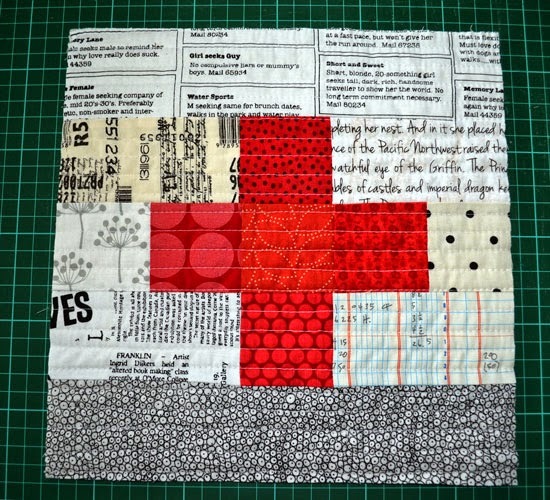 Gather your quilted block, backing and lining pieces along with the zip. 7. 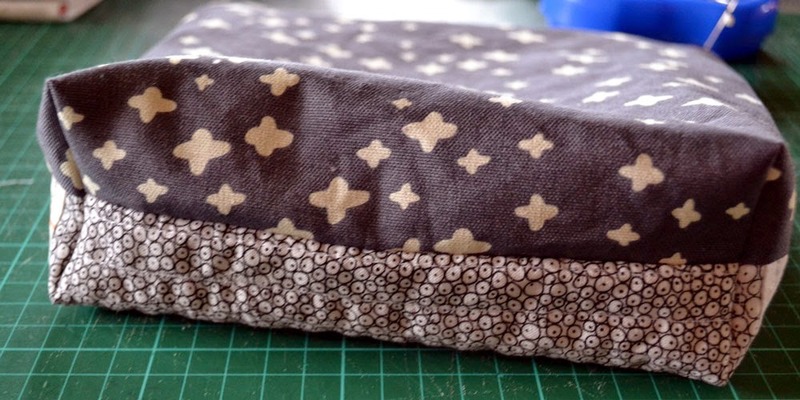 Lay the pieces down in the following order: quilted block right side up – zip (with zipper pull to the right) right side down – then one peice of lining right side down. 8. 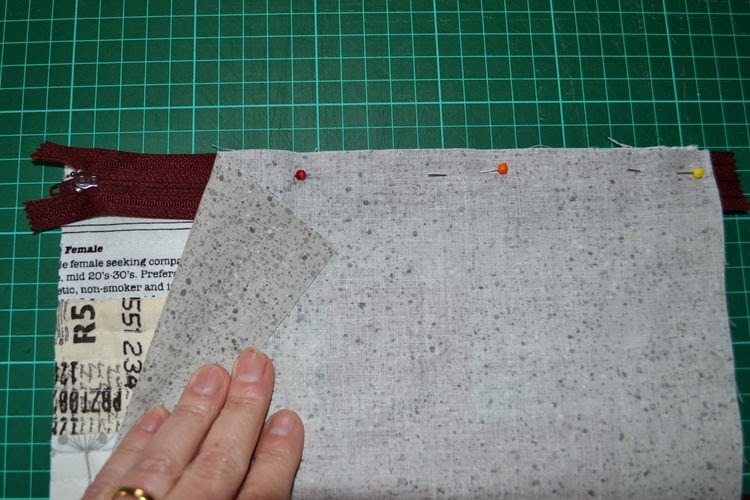 Pin across the top and stitch the layers together using a zipper foot. 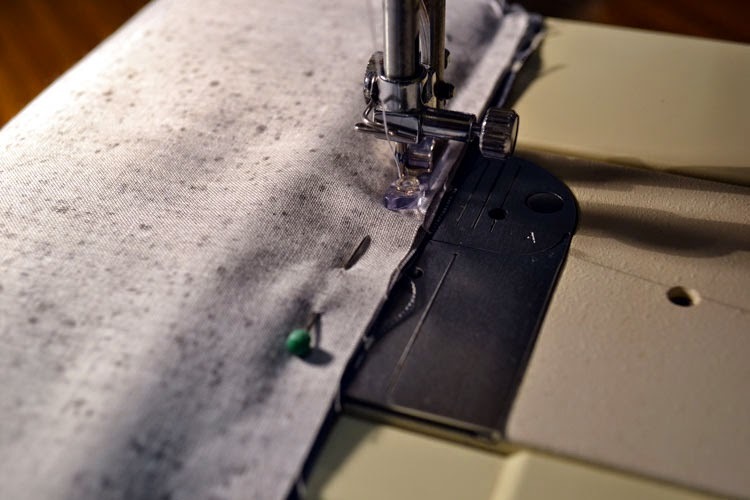 You may need to pull the zipper open about halfway, then lift the presser foot and finish stitching the seam if the zipper pull gets in the way. 9. 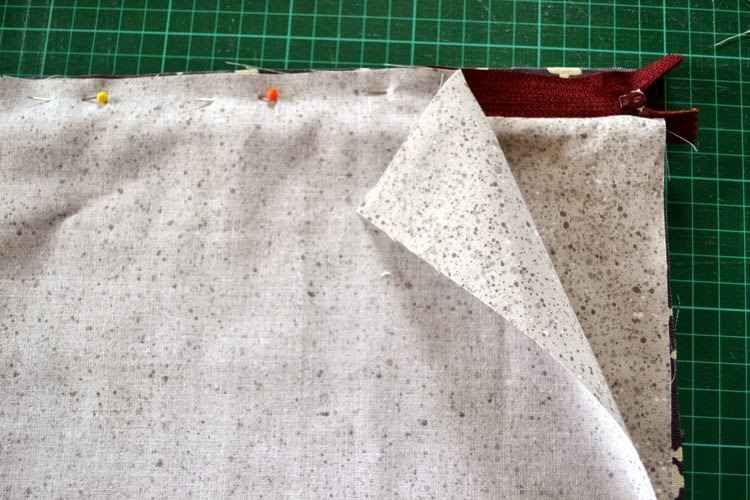 Flip the lining back around the zip so that the fabrics are wrong sides together and press. For the other side of the zip, layer the pieces in the following order: backing piece right side up – zipper (now with zipper pull to the left) right side down – second lining piece right side down. Pin and stitch along the seam again. 10. Flip the lining over again so both sides have the fabrics wrong sides together and press. Pin and top stitch along the zipper. 11. At this point open the zipper at least halfway then flip the fabrics again so that the front/back are right sides together, and the 2 lining pieces are also right sides together. 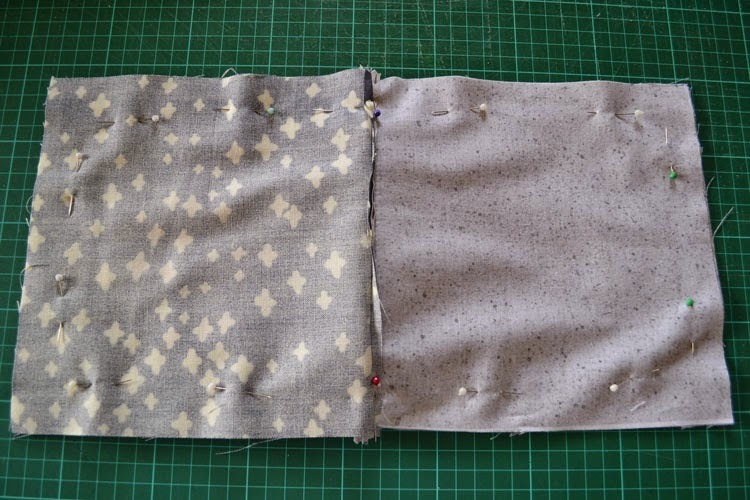 Pin the front/back and two lining pieces together, leaving a 3″ gap for turning in the lining (inbetween the 2 green pins on my photo), and stitch around the outside of the rectangle. 12. 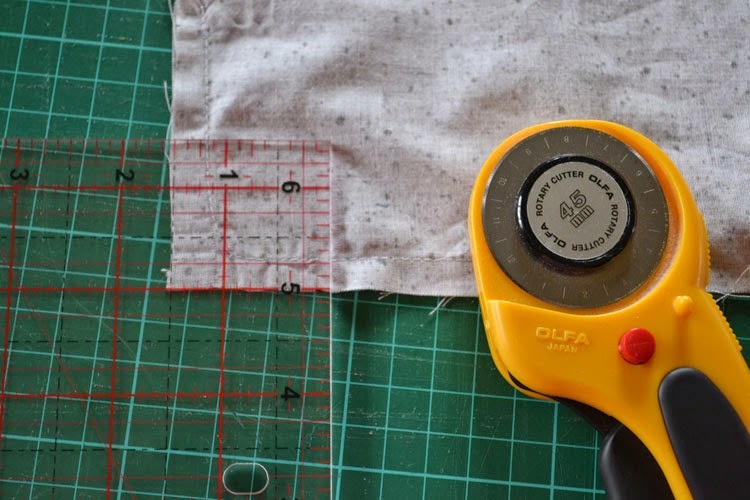 Using your quilting ruler, mark a 1.5″ square on the corner the lining and front/back pieces. 13. 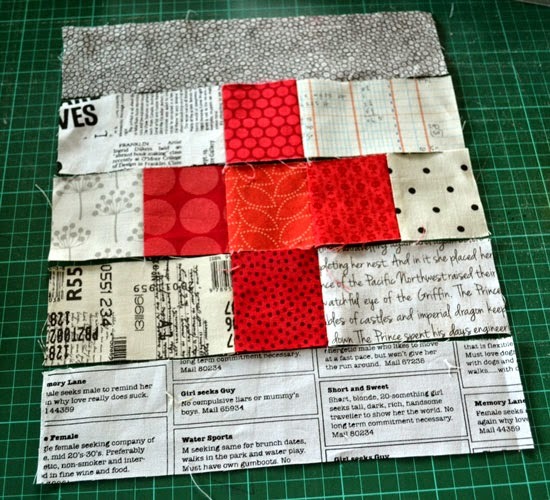 Then cut a 1.5″ square out rectangle. 14. Repeat this for each of the 4 corners. 15. 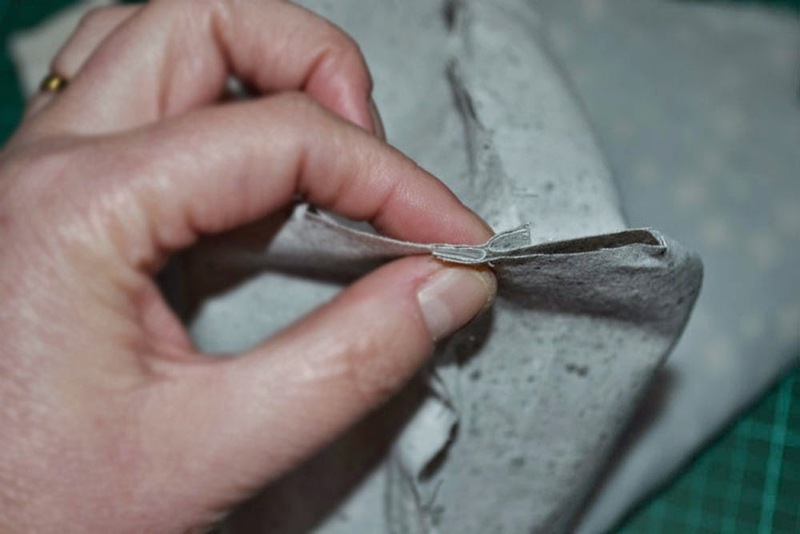 Pinch the corners together, matching the side and bottom seams and being careful to nest the seams. Pin and sew about 1/4 inch from the open edge. Repeat this for the remaining 3 corners of the pouch. 16. Now pull the pouch right side out through the opening you left in the lining. Press well and stitch the gap in the lining closed either by machine or hand. 17. Finally, push the lining back inside the pouch and you are done! 18. You should now have a nice flat bottom on your pouch so it can be stood up – you can also fit a little more into it this way. 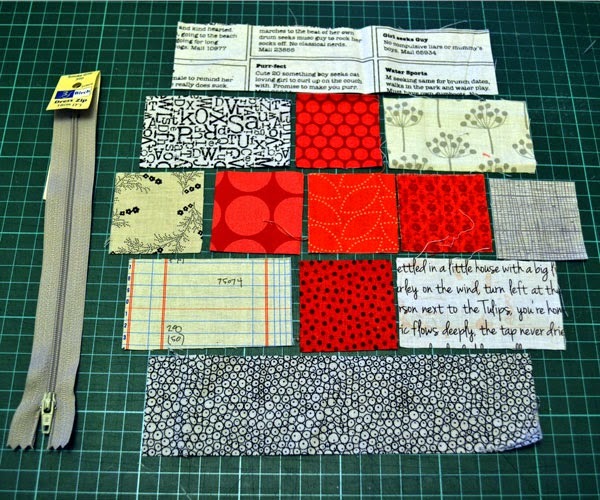 The backing and lining pieces for this larger pouch were cut to 10.5 x 10.5″ square and I used a 10″ zip. Disclaimer: I realize there are a lot of plus blocks out there, if you happen to have seen this exact one before, please know that I did my best to create my own variation of this plus type block and did not intentionally copy anyone. Thanks! 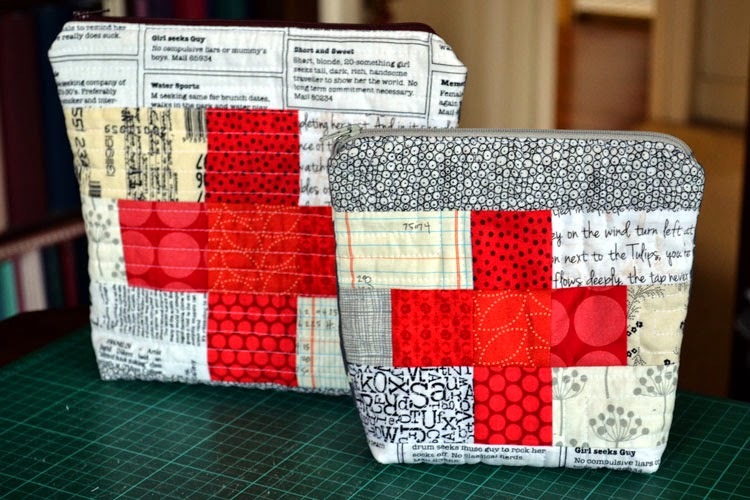 Such a fun idea, and great fabric choices! This is such a great idea. 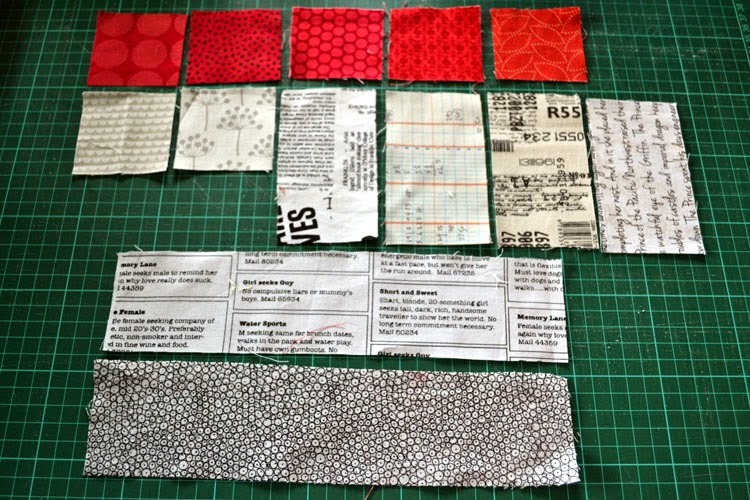 I am reminded of how much I love text fabrics. I love the red against the neutrals. What a great idea. Every one should have a well stocked one. Thanks for a great tutorial with clear instructions and really clear photos. Perfect! This would also be great for food allergy parents like myself to carry the life saving epi pens in. Brilliant! Love! 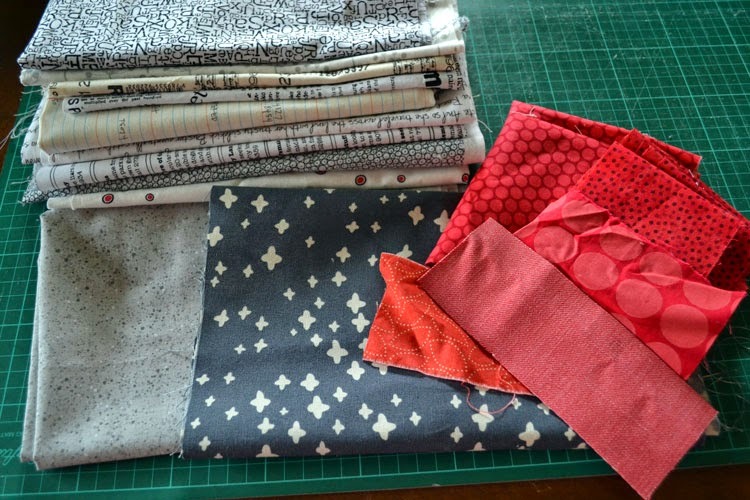 In fact, I loved them so much I included a link to your tutorial in a blog post I wrote about great Christmas gifts for quilters over on the Quilting Focus blog. 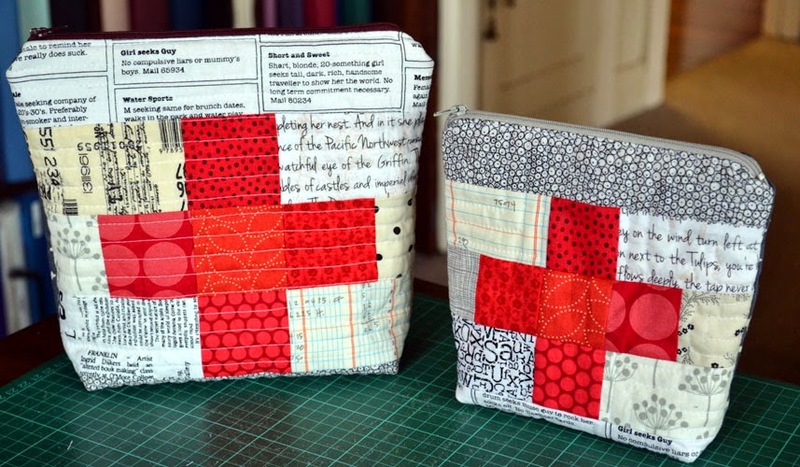 I suggested you could make quilt retreat survival kits out of them! Thanks Katy and Kirsten!